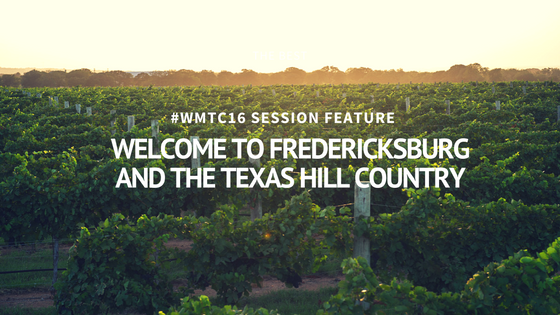 The first presentation at the 2016 Wine Marketing & Tourism Conference (after the pre-con Workshops and official welcome) will be a Welcome to Fredericksburg and the Texas Hill Country. By moving the conference to a new wine region each year, those visiting from out of state learn about that local region and including the specific challenges they face and successes they have achieved. In 2016, we are especially looking forward to hearing from the local area as Texas is booming in wine tourism and yet relatively unknown outside the area. We have a great panel (see below) including a winery owner, grape grower, and tourism agency director. Our moderator is January Wiese, Executive Director of Texas Hill Country Wineries, the association that represents the member wineries of the Texas Hill Country region. As a long-time WMTC attendee and Advisory Board member, January assures us the panel will be highly interesting and educational for the audience, revealing the both the successes and challenges of wine tourism in Texas! Chris Brundrett, co-founder of William Chris Wines, has established a career in the Hill Country as one of the state’s fastest rising young winegrowers. While earning a horticulture degree from Texas A&M, Chris spent time in the Hill Country, acquiring experience in the winery and the vineyard. He then quickly proceeded to take on head winemaking responsibilities for several wine labels, managing vineyard properties in both the Hill Country and the High Plains. In 2010, he planted the Brundrett Family Estate vineyard with his father Bruce in San Angelo, which will produce winegrapes exclusively for William Chris. Andy Timmons of Lost Draw Cellars is a 4th generation farmer who grows cotton, peanuts, and wine grapes. He established his first vineyard in 2006 and now owns and manages over 500 acres of grapes in the Texas High Plains AVA. One of the winegrowing pioneers of Terry County, Andy is committed to producing quality Texas grapes on a consistent basis. Working with some of the best wineries in the state, Lost Draw Vineyards has won several awards including gold medals at the San Francisco, Dallas Morning News, and the Pacific Rim International Wine Competition. In 2014, Andy was awarded the T.V. Munson Award from the Texas Wine & Grape Growers Association, which recognizes exemplary contribution to Texas grape growing. Ernie Loeffler is President and CEO of the Fredericksburg Convention and Visitor Bureau, which markets Fredericksburg and Gillespie County as a premier travel destination on the regional, national and international stages. Fredericksburg has many things to offer visitors, including its fascinating German history, but promoting the local food and wine is a major mission of the organization. Needless to say, we have an excellent agenda and experts lined up for #WMTC16….get registered today!